Recent additions of new health plan types in Ohio expands the number of plan types sold in Ohio to 17 in five categories types. In Ohio, benefits for autism treatments are fragmented and it is important to understand the different types of health insurance plans sold in Ohio, which has changed just in the past year. 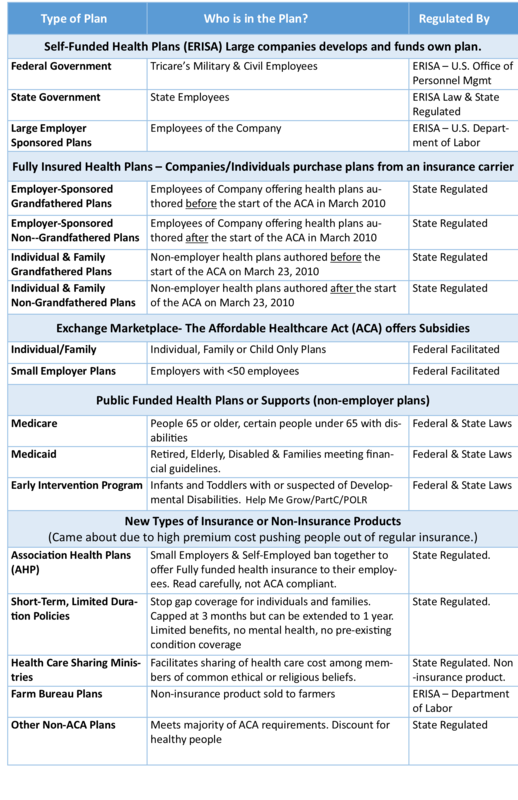 On the chart below, you will see the five different types of health plans sold in Ohio and who regulates the plans. Once you know the type of health plan you have, go to the Am I Covered? tab and learn where autism treatment benefits can be found. Health insurance companies offer employers different plan options when purchasing plans for their employees. In fully-funded health insurance, an employer pays a premium to the insurance company to provide health insurance. Self-funded insurance is when a company is operating it’s own health plan, taking on the risk and using a health insurance company only as a manager. Fully-funded insurance is required to follow Ohio law which includes autism mandate legislation. Self-funded plans are governed by federal ERISA law and not impacted by autism legislation. 57.4% or 6.6 million Ohioans had private health insurance coverage either through employer-sponsored insurance or non-employer individual/family plans. 36.6% or 4.2 million Ohioans had public health insurance coverage through Medicaid, Medicare or other government programs. 6% or 1.4 million of Ohioans were uninsured in 2015. The number of uninsured Ohioans decreased by half from 2013 to 2015, falling from about 1.4 million.